Right after the four accounts of the life of Jesus (referred to as the gospels), we enter the Book of Acts. The actual formal name is the “Acts of the Apostles”, but it has also been said that it could more accurately be entitled the “Acts of the Holy Spirit” because all that happens in the book is through the power of the Holy Spirit. Either way, this book is one of my personal favorites. It is written by Luke – almost like a 2nd part to his account of Jesus as investigated for Theophilus (Acts 1:1). While in his first part Luke shares with Theophilus what he has found out about Jesus while He was physically here on earth, the things he did, the reports of what He said, all that would be of interest to the inquiring Theophilus; in this second part Luke extends his investigation into what the small group of disciples did after Jesus rose from the dead. Many (myself included) see the Book of Acts as the prototype of how the Christian church should function still today. Afterall, remember that Luke was a scientific guy – a doctor – who was putting his own name on the investigation for Theophilus. He was vouching that what he had found out was true. (Some of which he personally witnessed!). If we can trust that his report of Jesus was based on fact then we should have no trouble viewing the circumstances in his second part as factual as well. So as you read through the Book of Acts, there are several main things to note and ask yourself about. You could consider them themes, which are based on facts (from Luke), and therefore demanding our attention and discussion on their existence (or non-existence) in our lives (both individual and corporate). – The first major change we come across as Acts opens is that Jesus is alive! The disciples saw Him on numerous occasions over the course of 40 days (1:3). After that time of teaching and encouraging, Jesus leaves for Heaven – telling them to wait for what the “Father has promised” (1:4) which will be the power and authority through the Holy Spirit (1:8). This is a major revelation of who God is and what He is up to within human history. 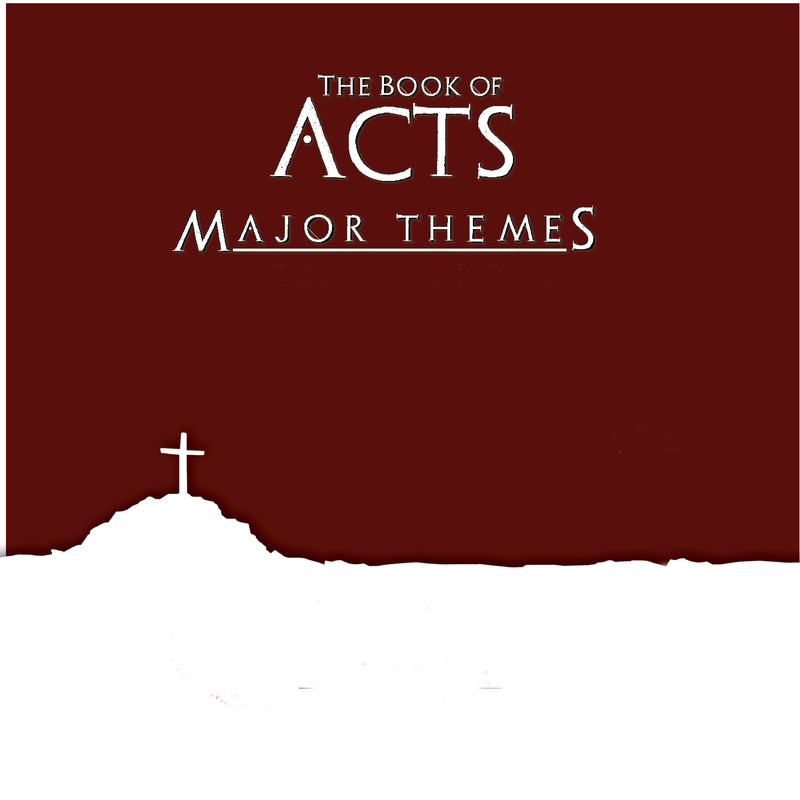 While He has revealed Himself as Father – Creator (Gen 1) and then The Son – The Word (John 1), now He is about to reveal Himself as the Holy Spirit – Performer of the Word (Acts 2). As the Son points mankind to the Father (to be re-created), the Holy Spirit points men to the Son. Question: Is the Holy Spirit active in my life or my church? Acts 2 – The original 120 followers (all saved) – accompanied with tongues. Acts 8 – The believers in Samaria (already saved) – tongues are not mentioned, but Simon obviously “saw something happen (vs 15-18). Acts 10 – The family of Cornelius (first were saved, then…) – accompanied by tongues. Acts 19 – The believers in Ephesus (already baptized by John for salvation) – accompanied by tongues. In each account recorded by the scientific Luke, we see individuals being saved and THEN baptized with the Holy Spirit. As well, in each case there is a clear demonstration of that baptism by the recipient speaking in tongues. Question: Have you received the Holy Spirit with tongues? If not, what is preventing you? – Luke also records numerous examples of the early Christians continuing the work of Jesus by healing those who are sick and in need. The lame man (chp 3), their shadows (5:15-16), by handkerchiefs (19:11-12), and Paul on the island of Melita (28:8-9) are just a few examples. Obviously Luke felt it was important for Theophilus to understand that the healing power of Jesus was STILL present in the initial believers after He had left and gone back to heaven (and the Holy Spirit has taken His place). Question: Are you seeing healings take place when you pray? – Another specific characteristic of the early Christians was their insistence that God would provide for their needs (both individually and as a group). Acts 2:44-45 describes them as having “all things in common”, even to the point of selling their stuff to help each other out financially “as every man had need”. As well, Acts 4:32-37 further describes them as giving a portion of their provisions for the good of the whole, to further the work of the community. Then in Acts 5 we see the unfortunate results of failing to be a part in this way (and lying to God about it). This is a continuation of the OT concept of paying tithes to God. Question: Is tithing still viable for the Christian today? Is God still reacting like He did with Ananias and Sapphira? – The final major theme we see in the days of the initial Christians is that of persecution. We see them imprisoned (chp 5), put to death (chp 7), Paul & Silas in prison (chp 16), along with a more detailed account of Paul’s arrest and trial (chp 23-28). Clearly the early Christians faced much opposition from the surrounding culture and the unbelievers. The opposition was physical – in the form of prison and death – not emotional, or illness (remember the healing) – and was in direct response to their insistence that Jesus was who He said He was, that he had risen, and that all men must repent of sin. Question: Are you facing persecution for being a Christian? If so – how? If not – why not?